This spring holiday we are delighted to be offering watersports taster sessions at the National Watersports Training Centre on Cumbrae. These sessions are designed to whet the appetite for watersports, and are open to all. Come along and try your hand at one of the below watersports, you never know you may discover a hidden talent. * Extra dates/activities to be announced, follow us on social media to keep up-to-date. * In adverse weather conditions please call 01475 530757 to confirm session will be going ahead. sportscotland are running an Instructor training scheme to help those suitably interested in gaining a career as a watersports instructor whilst gaining qualifications and experience at sportscotland’s National Centre Cumbrae. There are three positions available starting on April 2019. Trainees are encouraged to gain a variety of qualifications which can result in additional paid work at the centre and an eventual gateway to the world of watersports employment. The IDS programme combines a job aspect, about 19 hours per week, as well as a training aspect. To read the blog of Katrina who has just completed their 19 months on the scheme click HERE .It is great opportunity for motivated and driven individuals to gain Instructor Qualifications in a variety of watersports. Short listed applicants will be invited to Cumbrae for the opportunity to find out more and the programme Manager will explain in detail the IDS scheme, the role, and opportunities for individuals. IDS closing date applications is Friday 1st February 2019. Instructor Development scheme - What’s it Like? We are Currently have an advert for opportunities to join our Instructor Development scheme (IDS) .Having just completed 19 months on the IDS scheme Katrina Seator took the time share her experience in the hope of inspiring others join the scheme…..
Everyone thought I was crazy when I told them. I hadn’t made a decision in advance, I just went with the words that came out of my mouth at the time. Now at the end of my IDS contract I know I made the right decision that day . I went to Cumbrae as a level 2 paddlesport coach and kayaking is my passion. It was great having a choice of kayaks to take out whenever I wanted and it was amazing only having to carry them across the road to get to the sea. I was able to tag along on all the paddlesports courses and assist the leaders, helping build up my logbook. Being IDS meant I got 25% discount at Glenmore Lodge which allowed me to do paddlesports courses not run at Cumbrae. I am now a Sea Kayak Leader and Canoe Leader. I quite fancied yachting so after a few weeks getting settled in to the job, I went off on a weekend cruise. It was amazing. At one point on the first night I was left up on deck on my own in the dark helming and I couldn’t believe that I was in charge of this big yacht. It was exhilarating! Next month I did a competent crew course and learnt all the basics. After that I got out on the yacht as much as I could and did the day skipper theory course. I got to spend a weekend on the huge OYT Yacht which was another great experience. I loved it. By November I was a Day Skipper so I kept it up and moved on to the Yachtmaster theory and by March I had done my Coastal Skipper practical. I got out on the yacht as much as I could going round and round in circles picking up mooring buoys and MOBs. My hard work paid off as I finished off my contract by achieving my Yachtmaster. I was over the moon to gain such a big qualification. I had done a little bit of Dinghy Sailing before I went to Cumbrae but it wasn’t my favourite watersport. It was good having a variety of Double Handers and Single Handers on site to use whenever I wanted. The first time I went sailing at Cumbrae was on a catamaran and it was so much fun flying along whilst hiking out. I was having great fun until it pitch poled and I went flying round the mast then was under water, but that’s all part of the experience. In amongst all the yachtmaster prep. I was doing, there was a Dinghy Instructor course running and everyone kept telling me I should do it. They kept telling me a Dinghy was just a small Yacht so everything was pretty much just the same, apart from it didn’t have an engine. I decided to spend a few weeks dinghy sailing constantly and booked on to the Dinghy Instructor course. The course was interesting, I learnt a lot and I am now a Dinghy Instructor. I was in the office one day and found out there was a cancellation on a Personal Watercraft Proficiency course the next day. I had been jet skiing as a teenager on those rare occasions when the sun shone in Scotland and I had gone jet skiing on holiday abroad too. I completed the course and went jet skiing a few more times practicing manoeuvres. A space came up on a PWC Instructor course last minute and I decided to give it a go. I figured I’m already a snowmobile guide so it can’t be that difficult! The PWC Instructor course is the most fun Instructor course I have ever done and I passed so I’m now a PWC Instructor too. I decided I wanted to learn to Windsurf so I started going out practicing a lot, it was really exciting on a windy day when you managed to pick up lots of speed. I achieved my Intermediate Windsurfing certificate and I’m hopefully going to do my Windsurf Instructor in the near future. Being on the IDS at Cumbrae meant I lived in the perfect location to get out on the water every day. Who doesn’t want to wake up in their cosy little chalet and look out their window to see the gorgeous views across the Clyde?! It also meant I had access to all the boats and equipment to do all the watersports Cumbrae offers any time I wanted. The actual job itself was really good. I enjoyed working in the office and speaking to clients and giving advice on courses based on my experiences there. The job involved working mainly in the evenings and early mornings which was great as it meant your days were free to get out on the water as much as you wanted. All the staff at Cumbrae are very friendly and it’s like a big family. The catering staff make sure you get well fed, the office staff are very friendly and always make sure you are included and invite you to social gatherings and the senior instructors are always encouraging you to progress and better yourself. Thanks to everyone who took part in this year’s Sea Kayak Race. Please find the results below! As all experienced, and perhaps inexperienced skippers will know, it’s really not always plain sailing when out at sea. We are proud of our very experienced senior instructors here at National Watersports Training Centre Cumbrae and their ability to adapt to challenging situations. Here, our Senior Instructor, Angus Fergusson, tells us about one of those times. “It goes without saying; problems that occur whilst in open water can be slightly more challenging than those that occur whilst in sheltered water. Whilst running an RYA Coastal Skipper Practical Course last month we had just completed a passage of some 70 nautical miles in a northerly wind, Force 6-7. Ideal conditions some might say for completing your coastal skipper course! On this particular day we were sailing a short passage from Tarbert to Largs with a strong easterly blowing. Whilst rounding Ardlamont Point we had to keep a short distance off the buoy due to a military exercise taking place in Ettrick Bay. The boat was well reefed down with three reefs in the main, and a small handkerchief of a head sail in light of the conditions. We were close-hauled to keep ourselves clear of the lee shore and whilst doing so we heard a loud bang sound and suddenly the rig went loose. Our first reaction was that something must have snapped and unfortunately we were right. We looked up to see the backstay flaying around and the head of the mast rocking to and fro. The first question for me to ask was whether all the crew were safe and ensure no one was hurt. Once I was sure everyone was okay I took the helm and organised the crew, giving them all specific jobs to do so that we could bring the situation under control in a safe manner. Looking more closely at what we had lost it appeared to be the forestay. First and foremost we needed to secure the mast to prevent losing it. Arranging for two of the crew to go forward with life jackets on and harnessed to the jackstays, they were able to bring the spinnaker halyard forward to tie down. Whilst this was happening I was attempting to keep the head sail filled despite the head of it being some 5m from the hounds. By keeping the head sail filled I was able to keep the mast pulled forward. I used the engine to get us further away from the lee shore, in case the mast was to come down. Once we were further away we then opted to lower the main sail and tie it down, all the time making sure that the crew did not venture to the leeward side of the boat. We were unable to roll all of the head sail away so we gingerly motored slowly head to wind. This helped us lower the foresail and foil onto the deck were we secured it down. Once safely ashore we inspected the damage. We discovered it was the toggle at the top of the foresail that had snapped, which is very unusual. If the forestay does break then motoring down wind will help keep the mast from being pulled forward. On this occasion keeping the headsail filled kept the weight being pulled on the cap shrouds. Do not let crew go to leeward in case the mast does come down. Keep in touch with the coastguard on your situation. Although very rare, dangerous situations can arise when at sea. It is always important to keep calm and use all of your training and knowledge to assess the situation and keep the crew safe. Our coastal skipper courses, with senior instructors like Angus, will set you up well to be able to handle lots of different types of situations, but hopefully not a repeat of this incident any time soon! Katrina Seator is an instructor here at National Watersports Centre Cumbrae. 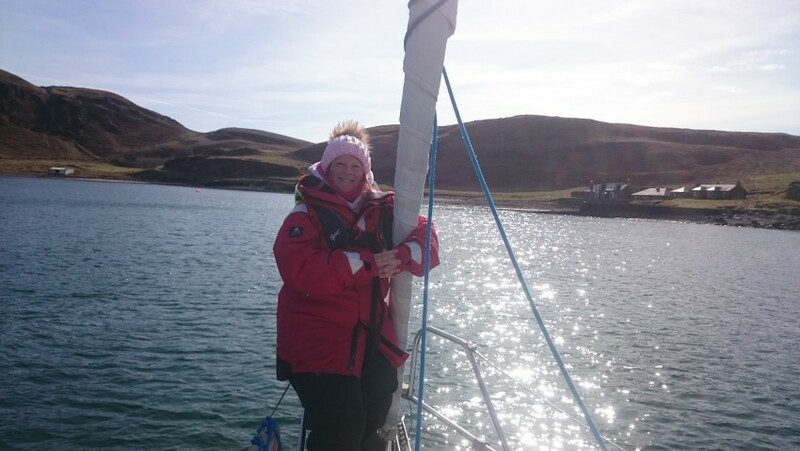 She recently joined the crew on board one of the centre’s yachts for a Coastal Skipper course in challenging weather conditions. Here she writes her account of the week. At 19.30 I met up with our skipper Stuart and the rest of the crew. We had a look around the yacht to get familiar with our surroundings was and following a safety talk we headed to bed, or should I say bunk! I got up at 7.30am and made breakfast for everyone. We had a look at the weather forecast and the charts and made a rough plan for our week ahead. We decided to go to Campbeltown and made a passage plan including pilotage. We motored out of Largs Yacht Haven and got the sails up. The wind was very light so we changed the head sail from No. 3 to the Genoa, which is larger sail than what we had been using. We motored a lot of the way, it was partly sunny and we had lunch on deck as we cruised along. We practiced a few Man Overboard drills along the way and we arrived in Campbeltown late afternoon and watched the sun set over Davaar Island which was a stunning sight on our first night. Whilst dinner was cooking we practiced manoeuvring in confined spaces and berthing alongside different pontoons both bow and stern. We decided we were going to go south to Sanda Island the next morning so I was asked to make a passage plan as I had never been there before. There is a lot of tidal movement around the island so I had to take this in to consideration when deciding what time to depart. Early in the morning whilst I finished my pilotage for Sanda Island down below, the others went up on deck and practiced some blind navigation, sailing of a pontoon and finding a spot depth. As we departed Campbeltown we had a good combination of sun, wind and tide all the way to Sanda Island. I had to keep a close eye on the time as we only had a short window to arrive at a favourable state of tide. We arrived at 13.30 as predicted and dropped the anchor in a gorgeous little bay. It was very scenic and sunny and we considered going for a swim, however the cold Scottish breeze convinced us otherwise! We agreed we would have some rest and complete a night sail to Loch Ranza. We worked together on a passage plan and took advantage of the tides by leaving just before dark. As we headed up the Kilbrannan Sound we decided to increase our night passage to 40 miles and go all the way to Tarbert as we had a maintenance issue that could be fixed easier in a harbour than on a mooring buoy in Loch Ranza. By the time we got to Carradale I found myself alone on deck enjoying the peace and quiet as the crew went down below to rest and warm up. I helmed the yacht all the way to Tarbert. I found it both exhilarating and calming sailing in the dark, I loved it. We arrived in Tarbert just after 1am and went straight to bed. We stayed in bed slightly longer this morning due to our late arrival the night before but we were greeted by a howling wind. We decided to do a shorter journey to Port Bannantyne due to the adverse weather so we did all the chart work before heading out to the wind and rain. We departed Tarbert and put up our storm jib, luckily the wind decreased so we changed back to the Genoa. We beat to windward for hours with the wind and rain hitting us in the face before reaching calm water as we entered the West Kyle of Bute. We sailed through the Burnt Islands and down the East Kyle and arrived in Port Bannatyne just before dark. We had dinner and decided we would head to Helensburgh the next day to do manoeuvring and berthing practice. We went to bed but it was hard to sleep with the wind howling and the rain battering down on the boat despite a tiring day facing it! We woke up to force 7 winds and white horses all around. The waves were crashing over the marina wall. None of us were very enthusiastic about heading out to sea so we had nice warm showers and bacon rolls and were very happy when skipper Stuart decided we should do theory inside for the morning! We learned about diesel engines and how to check them and we looked at different weather forecasts and how to predict the weather ourselves. By lunch the wind had decreased to a force 6 so we set sail in to the big waves. Our plan was to go to Kip Marina so I did a quick pilotage plan. However once underway we decided, by way of a group vote, due to the wind strength and direction we would go back to Largs. It was very windy and wavy and the sailing was really exciting despite it’s challenges! Once there we practiced Man Overboard under power and sail and berthing in the marina. Both of which were quite challenging in the wind but it was really good to know that we could achieve it in those conditions. We berthed up for the night just before dark and whilst we waited for dinner to cook we had a chat about cold water shock and helicopter rescues. We woke up to force 8 winds whistling through the marina. We had breakfast then went for a walk to the marina wall to check the sea state. There were white horses and you could actually see the gusts of wind blowing across the water. We discussed the conditions and what we wanted to achieve and decided to head out and practice picking up mooring buoys under sail. Once out it wasn’t as bad as it seemed and we really enjoyed practicing the skills in such challenging conditions. We stopped for lunch, had individual debriefs whilst we cleaned the yacht and were over the moon to find out we had all passed! Skipper Stuart and the rest of the crew were very skilled sailors and I had an amazing week on the yacht with them despite the challenging weather! As a Senior Instructor at the National Centre, you will be part of a team that shares a passion for Watersports. It is essential that you hold an RYA Senior Instructor qualification. You will also be expected to hold at least another TWO qualifications from the following; RYA Windsurfing Instructor, RYA Cruising Instructor, RYA Powerboat Instructor, Level 2 UKCC with BCU 4 Star Leadership. In addition to having the right qualifications you will also have experience in working with a range of client groups and at the higher end of National Governing Body qualifications. Overnight working and duties at the Centre or on the yachts is also to be expected. A proven leader and team player, you need to be strategically minded and be able to demonstrate a track record of building and maintaining strong and effective relationships with a broad spectrum of clients, from novices to experts, and other key business partners, both internally and externally. This is a great opportunity for a motivated individual who can bring their own energy to the role.